We offer cold laser therapy. This is a non-invasive way to help your pet heal faster from things like ear infections, surgical sites or broken bones. Laser therapy is also great for relief of arthritis, soft tissue injuries, wounds or skin infections. It helps to regenerate nerve tissue after surgery. Cold Laser Therapy uses light to stimulate cell regeneration and increase blood circulation, treating the surface of the skin only. Lasers are a beam of light that generates heat and penetrates the tissue. The treatment does not burn the skin. 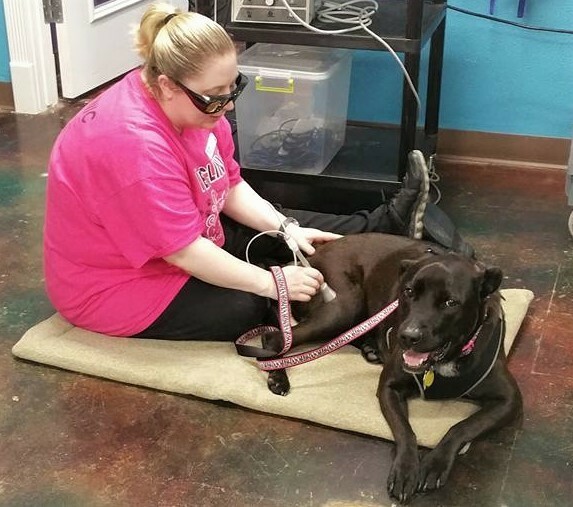 Pets often find laser therapy relaxing and tend to enjoy the treatment. Typical laser therapy sessions last between three to 20 minutes. There's no need to shave or clip the area to be treated and the animal doesn't need to be sedated during the process. Treatment can be applied multiple times a day or a number of times per week.